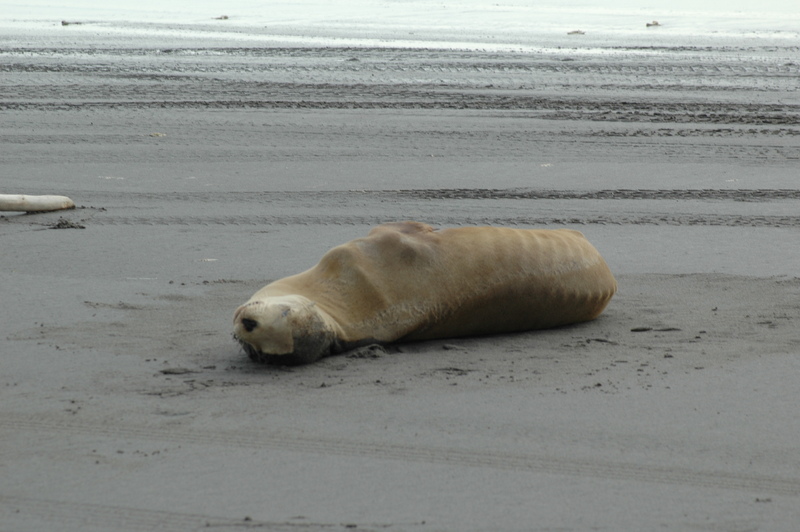 On Friday I drove out to spend a peaceful, sunny afternoon at an ocean beach, but instead of finding serenity, I came across an emaciated female California sea lion. I learned from locals passing by that she had been seen there for the past 5 days!! She was obviously sick or injured and had been starving for a long time. I couldn’t see any bullet holes, but there were over two dozen commercial fishing boats (trawlers) visible just offshore. There has been a rash of 20+ dead sea lions with gunshot wounds washing ashore this spring, and no one has any doubts that they’re being shot by the fishermen who view them as competition, the same way elk hunters in the Rockies see wolves. I called a nearby Aquarium who has been performing necropsies on the dead sea lions in the area, but they said they couldn’t (or wouldn’t) do anything about her. Everyone I spoke with to try to get some help for her said they couldn’t (or wouldn’t) get involved because they feared the National Marine Fisheries Service would “bankrupt” them with fines (no great threat to me as I’m pretty much broke anyway). The so-called Marine Mammal “Protection” Act makes no allowances for protecting injured sea lions–especially not a member of a species, such as the California sea lion, which isn’t currently endangered. It was a prime example of how the powers that be don’t allow any compassion for an individual animal whose species is not currently on the brink of extinction. Fisheries agency representatives have the same kind of detached attitude as land-based wildlife “managers,” showing no concern for individuals who may be suffering, only for animal populations as a whole. Why isn’t there something we can do for her? There are plenty of veterinary and medical facilities nearby, but no one can legally help ease or end her suffering. 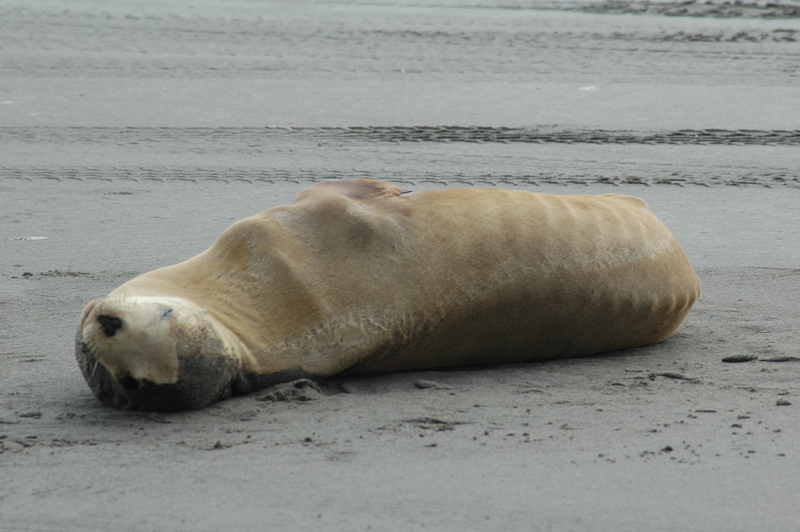 The authorities say they don’t know who is shooting sea lions out at sea (and they’re not doing anything to try to find out), but they’d love to bust anyone they thought was “interfering” with “nature taking its course,” even if it’s for humane reasons. 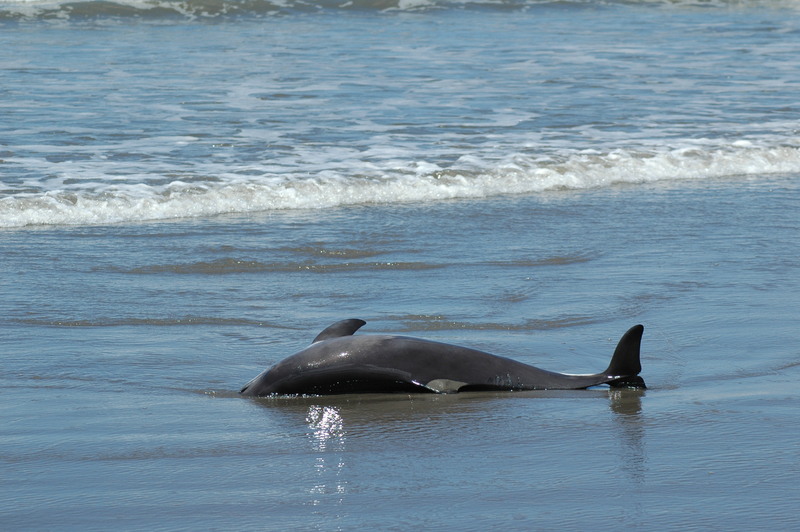 Earlier in the week I discovered a dead juvenile porpoise that had net marks above his tail. It most likely drowned in a fish net and was pitched overboard as bykill. These are just two of the many examples of the hidden cost of that fresh-caught salmon or fish filet in shrink wrap at your local market. This entry was posted in Uncategorized and tagged bykill, commercial fishing, marine mammal by Exposing the Big Game. Bookmark the permalink. The more I learn about DNRs and fish and game agencies, the more I come to realize their mandates are not the protection of wildlife. Their mandates are to protect the “rights” of special interest groups whose sole goal is to exploit whatever species they deem desirable in order to make a profit, or whatever species they love to kill in order to get their jollies. The whole thing makes me very angry. Thank you for doing what you could to try and save this sea lion. Yep, they definately aren’t looking out for all animals equally… I’ll keep you posted. It’s interesting as to how important it is to “let nature take its course” when the animal is considered a “pest” or at the very least, its species is not endangered. It perhaps may be understandable that no one wanted to spend the time, money and energy to try to save her, and at this point– it certainly isn’t likely. But what excuse can they have for not allowing her a humane death? It’s amazing how the body will go on and on. Frustrating as it is, I’m glad you helped her as much as you could. Again unbelievable! It seems to me this is heartless, and so wrong. No longer to I have any respect for fish and game/DNR, they continue to turn their backs on our wild life…our tax dollars are going to special interest groups! Wrong, wrong, wrong!!! Yep, it’s all about the almighty dollar for them. This is appalling- that no one can either feed her or end the suffering she is enduring?!? Clearly, when she raises her head and looks around, there must be some inner hope that help will somehow come…I am disgusted by this lack of empathy in the surrounding community. I would like to know what the outcome turns out to be. What a tragic and poignant story. Thank you for posting it and for caring about this poor sea lion. I’m so sorry you found no help for a marine mammal in distress. I’m a licensed wildlife rehabilitator/volunteer, and moved back to the Pacific Northwest after 20+ years in California. Although I don’t have marine mammal experience, we have several marine mammal rescues along the California coast who regularly perform field rescues for animals in the condition you describe. I’m so disappointed to learn that there appear to be no comparable rescues where you found this animal, particularly for species like California sea lions. I have to counter the “let nature take its course” excuse constantly. My counterpoint is that most of what we see in the way of wildlife injury is inflicted either by humans or our human technology, and it would be — for me, anyway — a perverse act of negligence not to intercede when the injury occurred because of human involvement. Thanks Ingrid, You’re right about the absurdity of saying “Let nature take its course” when the unnatural human world is almost always the cause. Unfortunately, though there are wildlife rehab centers here and in Oregon, only in CA is there a marine mammal rehab center. You would appreciate the Wildlife Rehab Center of the North Coast–they rehab many of the same raptors and sea birds featured on you wonderful photo site. Gli animali devono essere protetti.